Luxury destination club Lusso has just added a new home on the Turks and Caicos Island of Providenciales. Provo as it is affectionately known, is starting to be a popular location for several destination clubs. This comes as no surprise once you find out that the island has icing sugar white sand and tropical turquoise waters that average 84 degrees in summer and 76 degrees in winter. The Turks and Caicos have retained all the sleepy charm of their colonial past, and life has a relaxed pace, with an overall warm, friendly atmosphere. For anyone looking for a little more excitement there are excellent restaurants, golf, spas, fishing, water sports and some of the worlds best scuba diving. 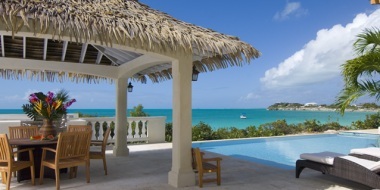 The Lusso home is located in the southwest portion of Providenciales, on Sapodilla Bay. This 3,800 square-foot home is designed with a casual elegance befitting its Caribbean setting. Each of the four bedroom suites boasts a walk-out bay view. All you and your friends need to do is choose whether to stay on the patio next to the infinity edge pool or wander down to your own private beach. Providenciales has its own international airport with flights from Boston, Dallas, Miami, New York (American Airlines), Atlanta (Delta), Charlotte (US Airways), Fort Lauderdale (Spirit Air), London (British Airways) Montreal and Toronto ( Air Canada). Most of the other destination clubs are located on the north shore of the island, near Grace Bay, with its 12 mile long beach. These clubs include Private Escapes, Quintess and High Country Club. Ultra luxury club Yellowstone Club World has it's own $20m+ private island in the Turks & Caicos.